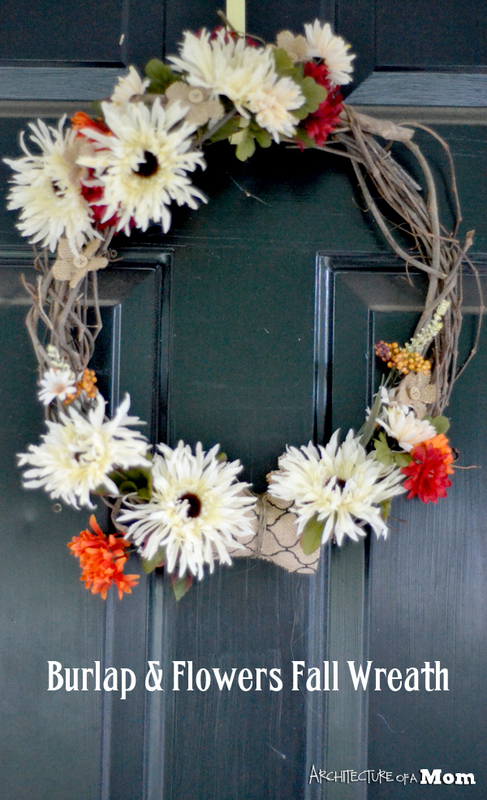 It is past time that I share a new seasonal wreath—a fall wreath. I mean, the last time I shared a wreath, it was my spring butterfly wreath...which turned into my summer one. It became so much of a fixture in the house that my 3-year-old twins got upset that I took it down to put up my burlap and flowers fall wreath. I mean, how dare I remove butterflies from the house! But it was time to ease the house a little more into fall. If you're intimidated with designing wreaths, please don't be. It can't be simpler. I took a scrap of printed burlap (I used the rest on these embellished letters) and wrapped it around the wreath, tying it on with the twine. Then I just jammed the flowers in as I pleased, twisting the stems around the grapevine to secure. And really, that was it. No fuss, no muss.